Peyton Manning has been a fixture on the public stage for well more than two decades, from his days as a celebrated football prospect in New Orleans, through four spectacular seasons at the University of Tennessee, and as the face of the NFL during a historic 18-year career with the Indianapolis Colts and Denver Broncos. Manning’s résumé alone is enough to put him on the short list of the greatest players in pro football history: two Super Bowl victories, five league MVP awards, and the most wins, passing yards and touchdown passes of any quarterback to play the game. As the son of an NFL QB (longtime New Orleans Saints star Archie Manning), Manning revolutionized the position beyond his stats, attacking defenses with a cerebral approach that made his mind as much a weapon as his arm. Add in the endearingly goofy—and sharply funny— persona that he developed off the field through memorable commercials and comedy appearances, and you get an athlete who has transcended his sport to become a cultural as well as football icon. Sports Illustrated has been with Manning every step of the way and celebrates his retirement with a special commemorative edition collecting the best of SI's coverage of Peyton through the years. The scope and breadth of Manning’s career are captured in 104 colorful pages featuring SI’s trademark prose and photos: From John Ed Bradley’s 1993 profile of the young Peyton as a New Orleans high school football prodigy, continuing through Tim Layden’s definitive coverage of Manning during his record-setting years as a Tennessee Volunteer, through Peter King’s assessment of the aging star in the moments following the Broncos’ victory in Super Bowl 50. Few athletes have been born and bred to carry the mantle of greatness as Peyton Manning was. 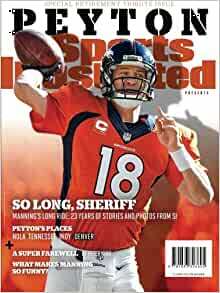 Even fewer have lived up to, or beyond, such expectations—and the Sports Illustrated Peyton Manning Retirement Tribute Issue is a fitting sendoff for this singular athlete. Peyton is my favorite athlete of all time. I am so glad I bought this. Have read it cover to cover. Football is no longer the same since he retired. Would highly recommend this magazine to anyone. I bought the Denver edition since I have become a Bronco fan because of him. Bought for my wife at her request for her birthday and she is loving reading it. I am a Peyton fan and this book was for me. A lot of trivial information I did not know, even though I have read his book. Found out why I have a Nerf ball with his name on it.